Metered parking is provided on Princess Street. We are 10 minutes walk from both Manchester Piccadilly station and Manchester Oxford Road Station. We are situated 200m away from St. Peters Square tram stop. We have just launced our new Bottomless Brunch Menu... come and try us out. Please contact us if you want to arrange a special event, we will work with you to create a package that suits you. Please contact us directly for more information on off-site catering. from 10-­100 people. For more information please contact us directly. stay, and keep them coming back. Limited choices on the menu, but it was a deal and all of us were sorted eventually. (The waiter asked the chef for some minor adjustments to one of the dishes due to dietary requirements. ) The food was tasty. Enjoyed food ver much. (We have been before)Our only complaint nobody to greet you on arrival hung around nearly 10 mins. Another couple arrived and they had the same experience. Nobody there for some time. Staff amazing. Food mediocre but can't complain as it was excellent value for money. Gorgeous food, outstanding service overall perfect evening meal ! Chips arrived cold had to send back. Not.much food for you money. Would not go again. I hadn't visited this restaurant for a very long time due poor quality food and service. I was very please to see vast improvements in all areas. I will definitely be returning again soon. We both had sirloin steak and it was one of the best steaks we have ever had. And the 50% off with the open table offer made the whole meal excellent value for money. Apart from the small menu (ie not much to choose from on the set menu) it was absolutely beautiful and myself, my partner and our guests all agreed. Top notch. Great value for money when dining with an offer of 50% off when having a starter and a main. From there on we walked into the entrance and walked down to the restaurant in a bland soulless hallway. The first impression is everything as the saying goes. As we were greeted by an employee prior to entering into the actual dining area we were not asked if we would like for our bags and coats to be taken. The restaurant was too bright and no customers present. Music was incompatible and the restaurant looked more like a banquet room (have some paintings on the hallway to give it some character, dim the lights, have some candles on the tables, introduce a cloakroom and implement a playlist of soft uplifting music). In regards to the food, I had the supergrain salad which had pieces of blue roll (apparently they dry the spinach with a blue roll which evidently is a wrong practice). For a main I had the half chicken which was a generous portion and appeared very appealing. The fat chips that accompanied the course were delicious however a bit overcooked and the chicken even though was nice it could do with the skin being more crispy rather than soft and soggy. Nevertheless, two people with 2 courses each and sharing a dessert including service charge and 2 drinks for the price of 35 pounds is great value for money. The restaurant can go a long way with some minor changes, especially on ambiance. Nice experience here. One of the only negatives was how quiet it was for a Saturday night. Think it would benefit from having some background music in the dining area. It seemed like everyone could hear your conversation. Lovely food and a nice hidden gem. Staff friendly. Went on Valentines and the staff looked and behaved they had been to a funeral. . . . . .terrible and very blase staff . . . . it was a horrible atmosphere everytime a staff member appeared in sight, not happy at work and did not want to be there. Thankfully, the food was great, really good, and the room is set out really well . . . great cutomers in the dining area . . but the staff and service, they would be rejected in McDonalds for lack of tact and non-sttentive of caring attitude. While we were finising off we were told there was no-chance of any desert as the kitchen was closed (9.46pm) next to us two tabels were still being served their mains . . ..this was not the top hat, we got ready to leave and as these two (Romantic) couples were trying to have an intimate dinner, the members of staff started to drag tables accross the floor to set up for breakfast . . . . AWFUL. . . what are they thinking . . . . terrible attaitude and not a care for who is paying to be there. . . . . . . .. . we wnt onto Gaucho fro drinks where the service was amazing . . and the contrast could not be more extreme . . . I have to say hand-on-heart . . what a shame . . . . 24 Bar & Grill could be something great, but it is just annoying as it behaves like a travelodge canteen not a retaurant! . . D-I-S-A-P-P-O-I-N-T-E-D!!!! The chicken served by the restaurant was raw and whilst the wait staff were friendly, the manager was rude and told us it was fine to eat - the waiting staff agreed that it was wholly inedible and "they'd never seen anything like that before". We left after this as we weren't comfortable that the rest of the food would be cooked well enough - the manager stated that she was "doing us a favour by not charging us for the raw food". So, If you want to risk getting ill from raw food and want to deal with bad management, go here - if not, I'd suggest going somewhere else. Fantastic service. Enjoyed ourselves a lot. Thank you. A great find! Lovely decor and atmosphere, food was perfect for me and my son. Traditional food, good for families. Food was good quality. The service was very good - we had a very attentive waiter named Ziggy who couldn’t do enough. The atmosphere was lacking as the restaurant was empty but it does deserve to be busier and represented great value for money. Great service and a lovely festive afternoon tea. Food was fresh and beautifully presented. Chloe the waitress couldn't do enough for us. Children's afternoon tea was great too. Well worth a visit. It’s cheap. It’s available for a last minute booking. There’s a reason for that. Stumbled across this one on Google for our visit to Manchester, and couldn't fault it....... If we're back in town we'll definitely be back! It was clear that the staff were stretched here. We waited over an hour for our first course and that again nearly for the plates to be taken away. However, the food was nice. Super-attentive staff who did everything a good team should. Good value well executed bistro style food. Will visit again. Food was not great. Steak was overdone to what was asked for. Found a fly in my drink and there was no sincerity from the staff just a simple sorry and got another drink. Dessert tasted like it had come out of the microwave. Very poor quality for a meal that cost over £100. Would have rather had a pub meal or a Nando’s. The food was outstanding the service was outstanding they also have a great number of cocktails 2 for one between 4pm til 7pm. I would definitely dine there again. Great food & lovely service :) also sampled a few cocktails. Only downside was the place was empty! Such a waste! Booked this in advance as i assumed it would be busy on a Saturday night . We booked for 9 and we were the only people in there the whole evening ! Either way food was really good and i would go back anytime . We booked a table for 12 people. The restaurant was very poor. There was only 4 tables being served in total and only 2 staff to do this. It took 25 minutes just to get a drink. It tooK another 20 mins to get the menu served and orders taken. When the food arrived it was obvious the food was chucked in the microwave. It was poor and over cooked and dry. Not one person enjoyed the food and the staff was overworked as you could see their stress. Ziggy the manager at least offered us a discount for the poor experience. He did his best with what he had. The Gentleman in the Blue skirt was also very helpful stepping in to help tables who were not being looked after offering complimentary bottles of water. He was charming and kept us entertained with his quirky one liners. If it was not for him, we would have left much earlier, so please make sure he is thanked as he deserved a tip. I will not recommend this restaurant to anyone. Bad service, cold/dark restaurant, did'nt have everything on the menu. The beefs were not medium as we ordered and they forgot the sides. It’s a nice looking place, very quiet though and staff were attentive. Food was average at best, a little overpriced for the quality in comparison to other restaurants. 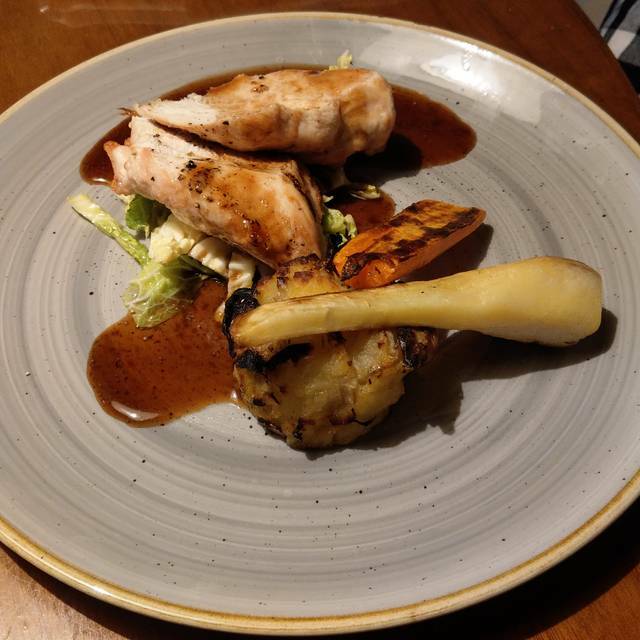 As there is so much choice of other restaurants in Manchester where you can get similar dishes of a better quality we probably wouldn’t return. Great food! 10 of us pre ordered dinner and it came out effortlessly. Staff couldn’t have been more helpful and the food looked and tasted amazing. We were very disappointed with the service. We had one waitress who worked very hard to look after us but she was continually let down. Starters all arrived at different times and were wrong. The food when it eventually came was good but then the same happened with the main courses. Had they been busy you could understand but the place was half empty, we won't be rushing back when you consider there are lots of alternatives in Manchester. Food was ok. Was not the best. I had a burger and the bread was soggy. Wasn't anything special. The price seemed ok till i came to pay where they then included tax & service charge so this is something to take into consideration when ordering. Overall i wouldnt revisit but was a handy place to go after the theatre at short notice. We came for a pre show meal with our headliners and team members, the food was great as was the service and for 8 people the bill was very reasonable. Will be back again fro any future evenst and bookings.